Once while shopping with my husband’s grandmother, I pulled a dress off a rack for her consideration. She took one look and exclaimed, “I could never wear that! That’s an old lady dress!” She was 94 at the time. In modern American culture growing older seems to mean becoming invisible; unfortunately this trend is also infecting the church. While researching a book, Sarah Bessey collected stories from women who disappeared from church leadership when they reached a certain age. How are we to respond to this trend in the church? 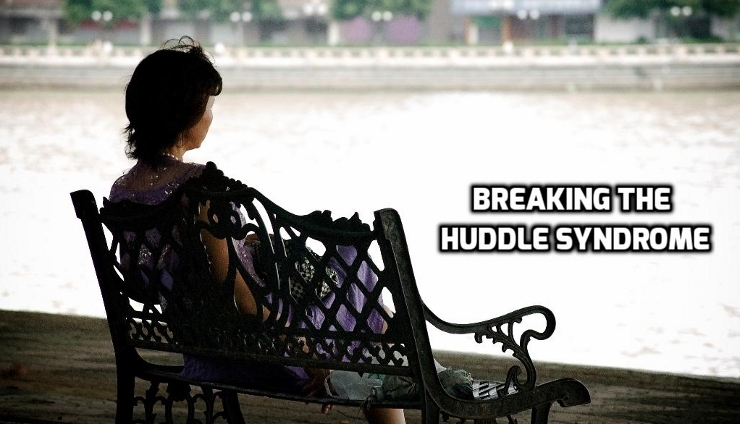 While I certainly don’t have all the answers, it strikes me that relegating older women to the nostalgia-bin is a symptom of “The Huddle Syndrome.” Fortunately, the Huddle Syndrome is easy to break. Imagine a party where everyone faces the center of the room. The people huddled in the center are the “in-group”, those deemed hip, cool and young, while everyone else stands behind them facing their backs. Still more people are on the outskirts and some stand in other rooms peering through the doorways. If you elbow your way to the center, do you know what you will find? Nothing special. Additionally, once in the center — no matter which way you turn — you would still lack contact with the majority of the people at the party. What else can you do? Turn around. Right behind you is someone wanting to be part of the group, to feel less isolated and more accepted. In any social group (including the church), no matter how left out you feel, you can almost always find someone who seems to fit in even less than you do. If a significant number of people at our strange party turned around, the huddle would break into several small clusters — each of which could foster an interesting connection. Rather than “the action” happening only in the center, “the action” could occur all over the room, in other rooms and even the backyard. Turning around is a ministry. The ministry of the body is not confined to the teaching and evangelizing of professionals or those in leadership. Each of us is a minister in Christ’s body, given our own gifts and opportunities to be used by God in the lives of others. Aristotle said, “Without friends no one would choose to live, though he had all other goods.” But we are not equally blessed by good friends. Friendships are like money: some are socially rich, while others are socially poor. Many older women find their social wealth plummets when they retire, or when their friends move away or their kids leave the nest. Men who work long hours find themselves isolated after work. Twentysomethings whose college friends have scattered across country may feel abandoned. People with families often have no more social support than singles. They may be lonely together but they are still lonely. The low priority on friendship in modern society means the fewer friendships have a chance to grown and blossom. People move more frequently. Extended families are scattered across state lines. Work relationships can marred by competition and office politics. And neighborhoods are filled with people who don’t know each other. The result is people live more isolated lives, with mainly virtual friends and our society has become friendship poor. If the local church is defined by the huddle syndrome with only the young and cool in the center, we will add to the growing isolation. But if we start turning around, the local church can be less like a huddle and more like “Cheers” — “where everybody knows your name and they’re always glad you came” — even if you’re not young, hip or cool. So the next time you feel socially isolated and left out, turn around. And if the woman you meet is older than you, just smile and introduce yourself. She’s probably lonely too. Photo taken by Johan and used here under Flickr Creative Commons.